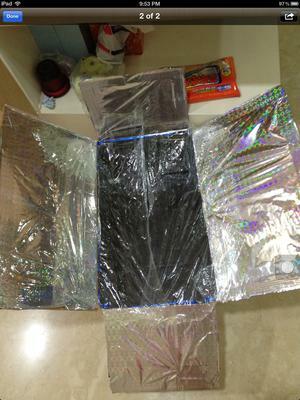 My group is doing a solar oven for our graded assignment. So far we wasted three days making two useless prototypes that cooled down the water that we were supposed to heat up. 1)	Prototype must be no bigger than 1m by 1m by 1m. 1)	Where should we paint black: inside, outside or both? 2)	Must our reflectors be at a 45 degree angle? Or what angle must it be at? 3)	How do we airtight the whole thing but still be able to put in and then retrieve our beaker of water without taping, gluing etc shut the opening of the box? The setup will be exposed to the sun at about 11-1pm for the actual test, but we have trial tests at 3-5pm every afternoon. Please help us. We need to get this done by 23/03/13 or we will fail our practical graded assignment! Let us see if we can get you some help and advice for your project. I do not have the time to respond with much helpful details at this moment since it is very late, but tomorrow I will be able to do so. Let's see if anyone else can help at the moment. Comments for HELP! Solar oven problems. Good luck! Solar cooking does work -- I have even done it in the Northern winter with snow on the ground! Your cooker will work better if it shiny on the inside also. So no black paint. Make it all shiny, put your dark pot inside a cooking bag, you need no further glazing or air-tightness and you will do just fine. Great to hear that you were able to improve on your model and your results! Would it not be fun to also try some other simple models to see if you can get them to perform as well or better? Maybe try the solar funnel cooker with a pot inside of a roasting/oven bag. And a medium size parabolic cooker made of cardboard and aluminum would work great I think. Just some thoughts and suggestions to see how well you could do on your own. Just as Cal wrote, it would be best to paint the interior of the box black so that it absorbs more heat. And it would be ideal for you to place your beaker of water into a dark colored pot or pan (with a lid) so that the dark pan can absorb and hold more of the heat. In order to have good insulation inside of your solar box cooker you would need to fit another smaller box inside of the bigger box and then you you can stuff paper, cardboard, cloth etc. into the gap between the two boxes and this will give you better insulation to hold more of the heat in. ...The plastic on your reflector panels might be inhibiting the reflecting ability of your reflector panels. ...And the lid on your cooker made of plastic wrap is probably allowing too much heat to escape. A glass window piece should hold in more heat, but it is not too much more efficient than plastic and you might have difficulty finding a glass pane, and you have to be careful not to break it with the heat. You might also consider this kind of a solar cooker for your project. It is quite effective and if done right can cook and heat up most anything you want. It is also inexpensive. A very effective solar panel cooker that has been used all over the world is what is known as a funnel style cooker. Parabolic cookers are your most efficient at concentrating the sun, you might consider one of these made with a used, discarded Television satellite dish, or form your own parabola using poster board and reflective tape or aluminum on it. Use black paint inside your cooker. Set your panels at about 67 degrees. Put your container of water inside a plastic oven bag and tie the end. And above all, use a black colored pan or vessel for your container. 3-5 PM is not the ideal time for tests. Try to do it earlier in the day. Like maybe at lunchtime. Hi I'm Yoon Yee's team-mate on the solar cooker project. We are extremely happy that you responded but can you please try to give us positive and constructive feedback. This is our assignment and our third trial has just failed. Can you please give us any, ANY form of advice so that we can at least improvise on our prototypes.This assignment counts for 10% of our total marks. We cannot afford to screw this up. OK, so the only change we made to the prototype you saw was to replace some of he gift wrappers with the shiny cardboard that cakes sit on when you buy them at the bakery. The interior of the box warmed up but the water did not even heat up to forty degrees Celsius. Once again,we are very happy that you replied and we are looking to see your advice.We are seriously depending on your advice.